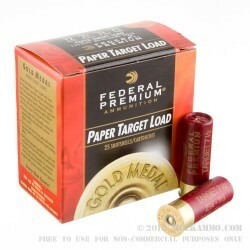 These Federal Premium Gold Medal 12 gauge rounds are the well-known Paper Target Shells. 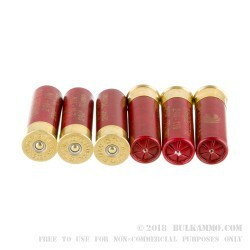 These rounds feature 2 ¾” inch mid-brass shells with the unique Federal Premium Paper Hulls, a 1 1/8 ounce shot load of # 7.5 shot, and a rapid muzzle velocity of 1235 feet per second, all in one perfectly engineered product. 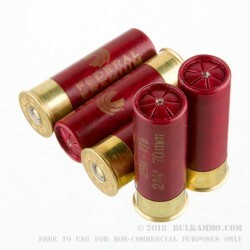 Designed for Target Shooting competitions, these shells use extra hard shot in the paper hulls, and a 209A Federal Primer in each primer pocket. When combined with the right type of choke, these Gold Medal shells create a tight pattern on paper that you can count on. 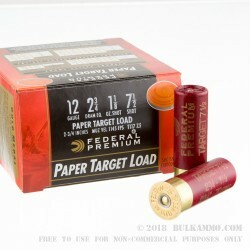 The Federal Premium Gold Medal 12 gauge Paper Target shells are an ideal solution for the target shooter, just shooting for fun, and the competitive clay pigeon shooter. The Federal Premium Gold Medal Line is known for its extra-hard shot and pattern repeatability. With numerous gauges, sizes, weights, and shot types available, these shells come ready to take to the range in boxes of 25 at a price to good to pass up.